Gay conversion therapy is a stupid, insulting, and completely delusional concept. Psychologists have repudiated it for years. The psychiatrist who (wrongly) claimed to have proved that it works it is genuinely sorry and has acknowledged that it's a huge and harmful waste of time. And now John Paulk, a poster boy of sorts for the "ex-gay" movement, has issued a statement apologizing for his involvement because — guess what? — he's still gay. 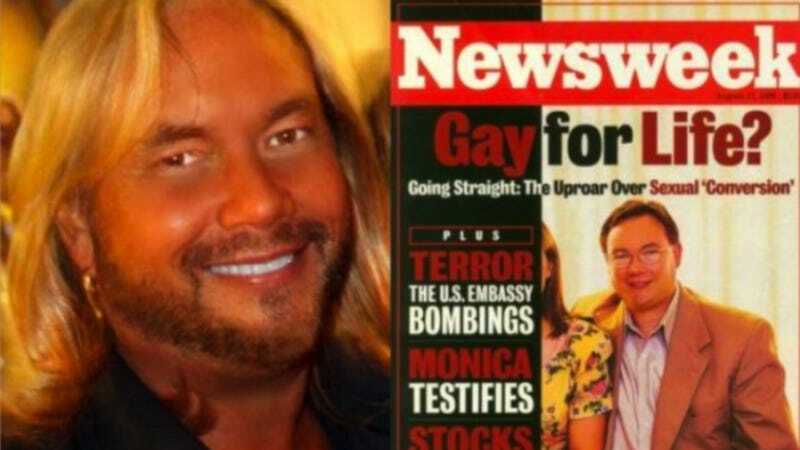 It's a significant and fairly brave step, especially considering that Paulk has been a very public advocate of conversion therapy: he appeared on the cover of Newsweek in 1998 advocating its efficacy and has published two books entitled Not Afraid To Change: The Remarkable Story Of How One Man Overcame Homosexuality and Love Won Out, which he co-wrote with his ("previously" gay) wife. However, this severely belated apology (which follows a flaccid non-apology released last week) is only a small step in redressing the considerable harm he's done to the LGBTQ community. [I]n 2003, I left the public ministry and gave up my role as a spokesman for the “ex-gay movement.” I began a new journey. In the decade since, my beliefs have changed. Today, I do not consider myself “ex-gay” and I no longer support or promote the movement. Please allow me to be clear: I do not believe that reparative therapy changes sexual orientation; in fact, it does great harm to many people. I don’t get any royalties from these publications, and haven’t since I left the ministry nearly ten years ago. I discourage anyone from purchasing and selling these books or promoting my “ex-gay” story because they do not reflect who I am now or what I believe today. Although it's doubtful that a statement from a "poster boy" who stepped out of the public eye an entire decade ago will cause this disgraceful movement to cease their babbling once and for all, it's encouraging to know that LGBTQ youth now have a (sort of) prominent figure to look to who succumbed to the pressure of bigotry and then recovered and asserted his identity once more.